Tested and certified independently by TÜV-SÜD: LABEX®-Laboratory Freezers with re-circulating air cooling are intrinsically safe. Each component in the interior compartment (ventilators, sensors) is particularly shielded to avoid sparks even when malfunction occur. Your advantage: Maximum explosion proofness and maximum temperature consistency. Intrinsic Safety - Our Unique Selling Postion. Intrinsically safe supply of the interior: Our LABEX© freezers feature specific saftey barriers that inhibit sparking even for gases with low ignition temperatures. Components (ventilators, sensors etc.) do not generate sparks even when malfunctions occur.They comply with the highest demanding Temperature class "T6" (surface temperature 85°C). Special conduction concept for electric currents that may arise due to static charge (e.g., operator, use of drawers etc.). We cover you in two ways: A maximum of explosion proofness and a maximum of temperature consistency thanks to our LABEX® technology and the adapted KIRSCH-re-circulating air cooling (optimized air guide panels). The unique combination of explosion proofness, automatic fast defrosting, controlled decompression and re-circulating air cooling lead to the safest and best storage conditions for your goods. 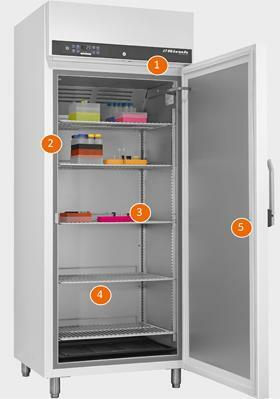 There are large temperature ranges available for storing goods: from -5 to -30°C. The interior is made of smooth aluminium with a transparent protective coating or of impact-resistant plastic with moulded supports. The drawers/shelves are adjustable within a 15mm raster for refrigerators with the interior of smooth aluminium sheet. The longitudinal and cross dividers within the drawers are individually adjustable. The lockable door has a plastic magnetic sealing frame that is easy to replace and door frame heating. There is no overhang when the door is open. Door hinge on the right as standard, however this can be changed to the left.